Doug is excited these days! He lost 30 pounds and 30 inches of body mass with the Insanity fitness program. Doug’s waist is now 6.5 inches smaller then before he started Insanity! His Insanity before and after pictures are amazing. At 37 years old, he is feeling 15 years younger. Doug is a different person now and he has Insanity by Shaun T. to thank for it! 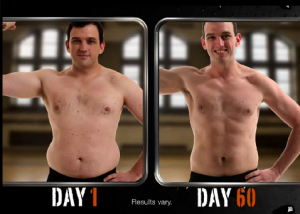 Doug stuck to Insanity for 60 days and ate a healthy diet as outlined in the Insanity Elite Nutrition Plan. He is not done yet! Fitness programs and eating healthy are not something you temporarily. You must incorporate daily exercise and eating right into your life. Are you up for the challenge? If Doug can do it so can you!